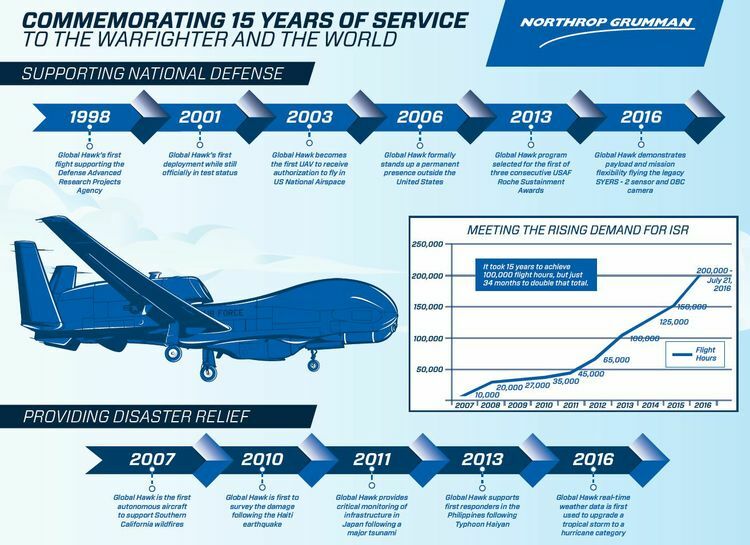 SAN DIEGO - Nov. 17, 2016 -- Northrop Grumman Corporation’s (NYSE:NOC) Global Hawk unmanned high altitude long endurance system will mark the 15th anniversary of supporting United States Air Force (USAF) combat operations. On Nov. 20, 2001, a Global Hawk took to the skies in support of Operation Enduring Freedom. Since that initial flight, Global Hawk has supported the intelligence, surveillance and reconnaissance needs of our nation. Originally designed to support the Defense Advanced Research Projects Agency evaluation of high altitude, long endurance aircraft, the Global Hawk demonstrator first flew Feb. 28, 1998. Development continued through 2001 when a Global Hawk system flew a historic mission from Edwards Air Force Base, California to Royal Australian Air Force Base, Edinburgh, Australia – the first time an unmanned system had crossed the Pacific Ocean nonstop. 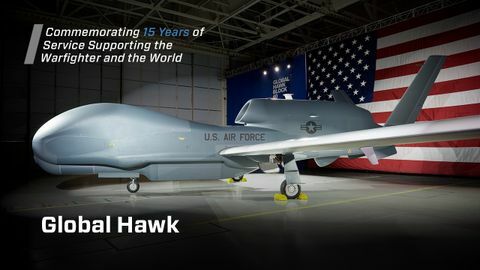 This historic trans-Pacific flight would become the norm when the Global Hawk system, while still officially in development, was deployed to support Operation Enduring Freedom. The Global Hawk landed in the Middle East in November and in less than 10 days was prepared for a mission to support warfighters on the ground. 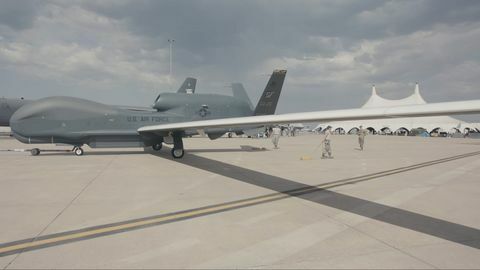 Northrop Grumman employees were forward-deployed, too, working alongside their USAF counterparts to get Global Hawk in the air and keep it flying to provide critical pre-strike and post-strike data necessary for effective combat operations. The team was led by Avis Anderson, now Northrop Grumman’s Director of Global Logistics and Operations. “Certainly there was a fear of the unknown, going into a strange place and not knowing what you would encounter; nobody wants to go to a war," said Anderson who volunteered to lead the small team of contractors. "But we had to go. The Air Force needed the system experts. The team did a great job and the system performed remarkably well." The Global Hawk system is building on its heritage of innovation, modernizing its current capabilities by integrating new technologies that enhance capabilities, performance and reliability. Earlier this year, Global Hawk successfully flew a SYERS-2 intelligence gathering sensor and the Optical Bar Camera broad-area synoptic sensor, both USAF legacy sensors. Northrop Grumman plans to fly an MS-177 multi-spectral sensor on a Global Hawk later this year. In July, the system surpassed 200,000 flight hours. 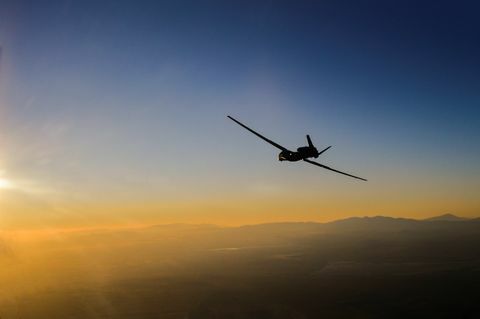 The U.S. Air Force’s Global Hawks logged 88 percent of those flight hours with the remaining hours flown by NASA Global Hawks, Germany’s Full Scale Demonstrator and the Navy’s broad area maritime surveillance aircraft systems. On Nov. 20, 2001, a Global Hawk took to the skies in support of Operation Enduring Freedom. Since that initial flight, Global Hawk has supported the intelligence, surveillance and reconnaissance needs of our nation.